Open Spaces: Massive Vintage R&B Presets by ModeAudio is Soundware (e.g. samples or presets that load into other products). 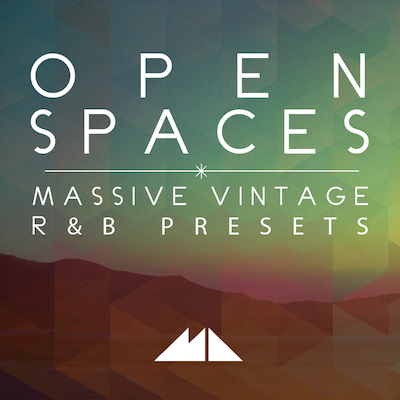 Open Spaces - Massive Vintage R&B Presets combines two of ModeAudio's favourite musical ingredients - vintage, analogue-style warmth and smooth, uplifting, chilled-out vibes. NI Massive has been transformed from a cold, digital beast into a lush, soulful synth with this release, bringing you 50 deeply-programmed synth presets that deliver bottomless, vibrant basses, gliding, characterful synths and dusty leads, dreamy keys, sifting, organic pads, dense, dramatic SFX and much more. Incorporating musical elements from the very finest in R&B and Hip Hop production today, ModeAudio have lifted NI Massive's lid off entirely to dig down beneath the surface, rewiring its versatile oscillator waveforms, scorching distortion units, unstable feedback circuits, snapping filter cut-offs resonances, deft delay lines and everything in between. The results are 50 warm, glowing synth patches that positively burst with internal movement and life - these sounds simply don't sit tight, they evolve, shift and dance to their own rhythms. Each and every preset offers up the complete range of 8 intuitive macro controls for effortless tweaking, giving you access to all the necessary dials and sliders to shape your sound to perfection. 50 accompanying MIDI loops, each packed with dynamic musical ideas including arps, chord progressions and lead lines, round-off this presets collection - it's high time you unleashed the vibrant, analog fire burning within NI Massive with Open Spaces - Massive Vintage R&B Presets.